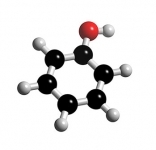 Phenol is still a relatively common substance used in various household products, mainly disinfectants. However, it is very toxic and can be straightforwardly fatal. Phenol is readily absorbed by the inhalation, oral, and dermal routes. Once absorbed, phenol is widely distributed in the body. Phenol is highly caustic to tissues. Skin exposure results in pain, then numbness, blanching, severe burns, and scar formation. Ingestion leads to burning of throat and severe gastrointestinal inflammation. Inhalation can result in pulmonary irritation and edema. Observed effects from acute exposure may include: shock, delirium, coma, pulmonary distress, phenolic breath, scanty/dark urine, and death. A probable oral lethal dose to humans of 50-500 mg/kg. Some individuals may be hypersensitive, with lethality or serious effects at very low exposures. Death and severe toxicity are usually due to effects on the CNS, heart, blood vessels, lung, and kidneys. Chronic exposure usually results in major damage to the liver, kidneys and eyes. Pigmentary changes of the skin have been noted. Consumption of water contaminated with phenol resulted in diarrhea, mouth sores, burning of the mouth, and dark urine. Those affected with hepatic or kidney diseases should not be exposed to phenol for any length of time, because even intermittent exposure to vapors may become dangerous. Phenol is used as a general disinfectant. It is used for the manufacture of colorless or light-colored artificial resins, and many industrial and medical organic compounds and dyes and as a reagent in chemical analysis. Aqueous phenol solutions have therapeutic uses which include topical anesthetic, topical antiseptic and topical antipuritic. Therapeutic veterinary applications of phenol include uses as a topical anesthetic and as an internal and external antiseptic. Phenol is also used in the preparation of cosmetics including sunscreens, hair dyes, and skin lightening preparations. Compounds containing phenol moieties can be used to prevent ultraviolet light-induced damage to hair and skin due to the UV-absorbing properties of the aromatic ring of the phenol.